Know any locals who are looking for a PDC in a beautiful destination? Shake off the snow and complete your PDC in Dominica! 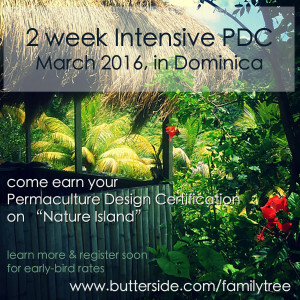 Mike Wird of Boulder/Denver and Papillon Ribier will co-lead a two-week intensive permaculture design course in Dominica in March, 2016, with guest instructors local to the island. Check out course details below. Act by December 31, 2015, to take advantage of the Early Bird registration rate! This is the opportunity for the people of Dominica as well as international students to come participate in a 2 week, 72 hour Intensive Permaculture Design Certification Course. Set in the beautiful South East Caribbean tropics, this course is based on the classic Permaculture curriculum as inspired by the work of Bill Mollison and David Holmgren. The course will take place from March 6th through March 20th, lead by Permaculture instructors and designers Mike Wird and Papillon Ribier, with a series of presentations by local community organizers, farmers, botanists, builders, and more. This certification course will expose participants to a wide variety of subjects in the form of lectures, demonstrations and hands-on workshops. We will be studying in some of Dominica’s most beautiful gardens as well as in devastated and urbanized areas. Residing on the design sites at Beyond Vitality and Eden Heights, looking through the lens of Permaculture, you will develop a deeper understanding of social and ecological patterns, principles and appropriate strategies. And most importantly, the quality of the relationships between them. The backdrop of this PDC is the current need for a healthy infrastructure that must eventually meet the needs and wants of the people of the beautiful Nature island of Dominica. Also note, this course offers this opportunity to participate in Community Supported Education. This offers a phenomenal means of exchange for anyone who may wish to take a course but does not have the cash to support it. Please check out the link for more information. I want to share the plant matrix I finally completed that encapsulates the last 10+ years of my edible and useful plant exploits in the Southwest and Rockies. It will live indefinitely for free on Brad Lancaster’s resource filled website. Special notes encapsulating my opinions, experiences, and knowledge accompany each species of nearly 200. Growing Gardens of Boulder County has announced an opening for a Boulder Cultiva CSA Farm Manager. This is a unique opportunity to manage a CSA on zoned agricultural property in the heart of Boulder, at an organization that interfaces with many members of the community through community gardens, volunteerism, gardening and cooking programs, CSA and plant sales. Do share this opportunity with anyone you think might be a great fit!